So-called Criegee biradicals were implicated in several vital processes in the chemistry of the atmosphere - links in the complex cascades of reactions by which one chemical is processed into another. In particular, their existence was incorporated into models of how pollutants like nitrogen and sulphur dioxide are turned into nitrates and sulphates; this means they play an important role in controlling the climate. But this is the first time the molecules been observed directly, using custom-designed instruments and a special kind of ultra-intense light produced by powerful particle accelerators. Known as synchrotrons, they let researchers observe the basic structure of molecules in incredible detail as it changes over tiny intervals. The molecules turn out to play a role in removing pollutants from the atmosphere, as well as influencing the climate. They do this by accelerating the production of sulphuric acid, which triggers cloud formation. These in turn block sunlight and cool the Earth. The intense synchrotron light showed that the Criegee biradicals interact with other atmospheric compounds very quickly, bringing clarity to what was previously a deeply uncertain area - estimates of their reaction speed varied as much as a millionfold. "We've known for a long time that Criegee biradicals are involved in several important reactions in atmospheric chemistry, but nobody's been able to observe them directly until now," says Dr. Carl Percival of the University of Manchester, one of the report's authors. Rudolf Criegee first suggested the particles' existence in the 1950s, and they have become a standard hypothesis in chemical textbooks. When volcanoes erupt, they blast large volumes of sulphur dioxide into the atmosphere. 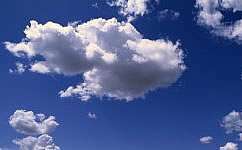 Scientists have long known this has a cooling effect, as the sulphur dioxide is turned into sulphates and eventually into sulphuric acid, which causes clouds to form. The new findings demonstrate a previously-unknown mechanism by which this transformation can take place. "This new source of atmospheric sulphates is at least as important as the one we knew about already, and in some cases it can dominate," Percival explains. Climate models will probably need to be updated to take the discovery into account. The breakthrough, described in a paper in Science, was made by researchers at the Universities of Bristol and Manchester and at Sandia National Laboratories. The last group designed the specialised equipment that allowed the synchrotron at the Lawrence Berkeley National Laboratory's Advanced Light Source to be used to follow these reactions. Some of the chemicals that eventually form Criegee biradicals, known as alkenes, are produced mostly by plants - only about 10 per cent come from other sources. So the discovery highlights yet another deep connection between the biosphere, the chemistry of the atmosphere and ultimately the climate system. "A significant ingredient required for the production of these Criegee biradicals comes from chemicals released quite naturally by plants," notes Professor Dudley Shallcross of the University of Bristol, another of the paper's authors. "So natural ecosystems could be playing a significant role in offsetting global warming." Radicals are molecules with one or more of their chemical bonds broken. In this case, two bonds are broken, making Criegee radicals extremely reactive. This accounts for their importance in the atmosphere, but also makes them hard to detect - almost as soon as they've formed, they have reacted with another chemical and disappeared. Percival says the team now plan to turn their attention to other types of Criegee biradicals, using similar methods to investigate their rates of reaction. Thats not all the story. Helium is a greenhouse gas for the sun. The sun converts hydrogen to helium. In 4.5 billion years the sun heats up 20%. The biosphere compensates by sequestering carbon dioxide out of the atmosphere and stores it underground. The earths temperature remains relatively constant until there is very little CO2 left. The the highly efficient C4 plants (grasses) evolve to scrub the last of CO2 out. This negative feedback loop falters. Unstable temperatures result in ice ages and interglacials. The planet is in crisis. Then along comes man. Oooh! Look at all that lovely Carbon. I can make a lot of money burning that. Never let little children play with matches. They will burn the house down. Pollutants like nitrogen??? Surely they jest. That must be a typo or the like since nitrogen doesn't come up in this article again... Pollutants like nitrogen indeed! That's like complaining about all the environmental damage oxygen causes! Both elements pollute atmosphere as dioxides. Pure nitrogen is of course the main ingedient of the atmosphere.